Erin and Colin were married last October at the stadium. HUGE fans of the Cardinals, they cheered for their team, while secretly hoping there would be no game at the stadium on October 30th! No game meant a great wedding for a cute couple! The bride and groom’s picture lit up the big screen! Erin carried a bouquet of white, green and pink. (Not Cardinal red!) It included lots of texture using succulents and orchids. The bridesmaids’ flowers were very similar to the bride’s with a little more pink added in. Getting ready for the ceremony! The reception was held at Mad Art Gallery. 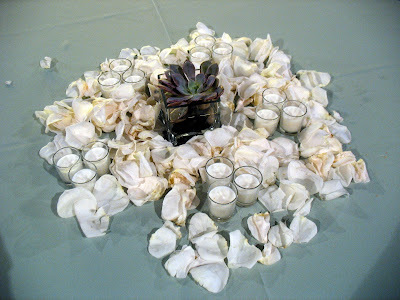 The cocktail tables were decorated with floating succulents (similar to the ones used in Erin’s bouquet), candles and petals. 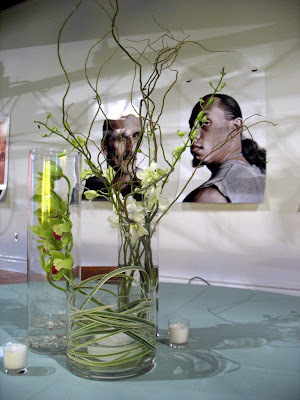 The guest tables had three vases-one with submerged variegated lily grass, one with a green submerged orchid and one with curly willow and white orchids. A very modern look for a modern venue. Best wishes to the bride and groom for a successful 2010–for their marriage and the Cardinals! !